The light from the sun (on the right) is the chief source of illumination in this scene. Various unnamed Hebrew people, who have walked from their camp (in the background) down to see the river Jordan. 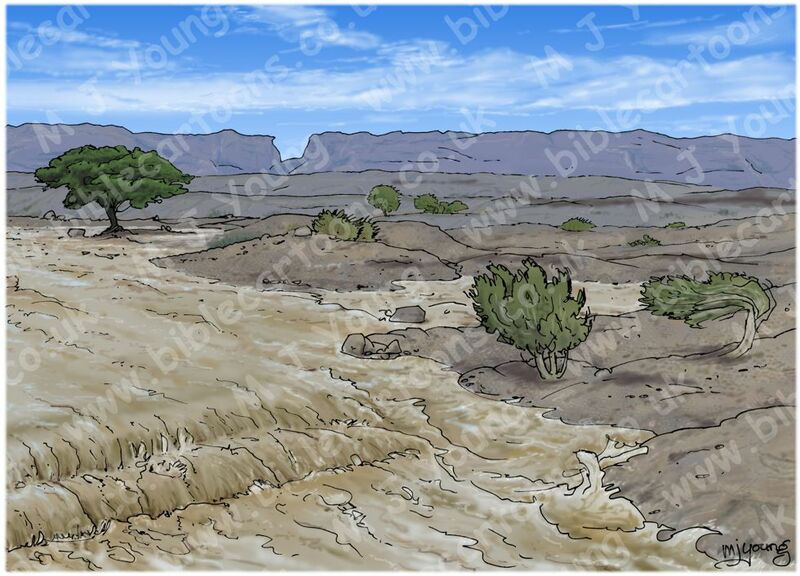 There aren’t that many scenes I get to draw involving water, many of the stories of the Bible seem to be set in the waterless desert, so it’s been lovely to illustrate the movement & flow of water for a change! The water is flowing from left to right, coming from the Sea of Galilee & going down towards the Dead Sea. We are looking towards the eastern river bank & the landscape of the desert wilderness which the Hebrew people had been in for the past forty years. The Promised land is behind the viewer, in the west. The only thing blocking the Hebrew’s path is the mighty river Jordan. 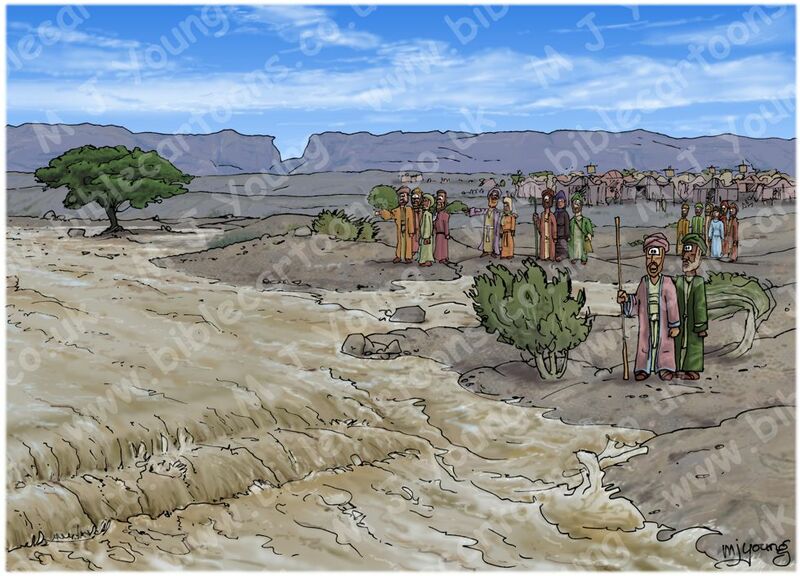 I found some photographs of the Jordan river in flood on the internet which helped me to design this scene. During non-flood seasons the river appears to be only a few tens of feet wide, but during flood season it can be up to several miles wide, with treacherous, fast flowing waters. Since flood water stirs up sediment (mud, clay, etc) & carry it in suspension, the water illustrated here is muddy brown, rather than being clear & blue! Incidentally, flood water is very powerful & able to move very large rocks. Several of which are picked up from the middle of the river bed in later scenes. Note the Hebrew tent encampment in the background, with tribal banners on display. 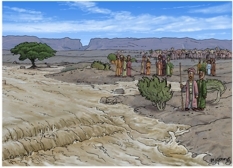 The small shrubby trees are Juniperus phoenicea – Phoenicean Juniper – Juniper tree, as illustrated in the previous scene.